Happy Birthday, Kareena Kapoor Khan. You must be so lucky to have a sister like Karisma, who dug up a piece of throwback gold from the Eighties just to post it as a birthday greeting. 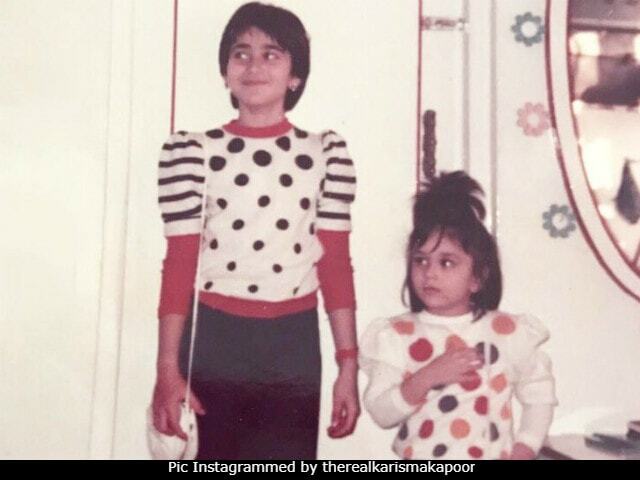 As Kareena gears to blow 37 candles out on her birthday today, there comes a post from Karisma that must have made Eighties kid Kareena very, very nostalgic. In the picture, the Kapoor sisters feature as much younger versions of themselves. They are adorably wardrobe coordinated with trendy hairstyles - Karisma in short hair and Kareena in a ruffled pony of sorts. In the picture, the younger child is actually unrecognisable as Kareena. "Happy birthday to my darling baby sister and best friend," is how Karisma wished Kareena. Hashtags like 'fashionistas', 'learningearly', and 'the80s' followed. There are glimpses of Karisma and Kareena's fond memories on the 43-year-old actress' Instagram. Our personal favourite is one which was shared last year and dates back to 1997 when when Raja Hindustani fetched the Filmfare Best Actress award for Karisma - which was her first Filmfare win. Kareena made her debut three years later with Refugee and was not yet part of the industry when the photograph was taken. Last year, the Kapoor sisters stunned fans and followers when they featured on the cover of Hello! magazine's October issue - Kareena was heavily pregnant then. Kareena and Karisma recently starred in an advert for a jewellery brand recently after which Kareena joined the sets of her next film Veere Di Wedding. Veere Di Wedding marks Kareena Kapoor Khan's first film post pregnancy. Also starring Sonam Kapoor, Swara Bhaskar and Shikha Talsania, Veere Di Wedding is expected to release next year.